ACUPRESSURE : a form of alternative therapy in which manual pressure is used to stimulate specific points on the body along what are considered to be lines of energy. CHIROPRACTIC : a system of complementary medicine based on the diagnosis and manipulative treatment of misalignments of the joints, especially those of the spinal column, which are believed to cause other disorders by affecting the nerves, muscles, and organs. MOXIBUSTION : the intention of stimulating circulation through the points and inducing a smoother flow of blood and qi. MASSAGE : The rubbing and kneading of muscles and joints of the body with the hands, especially to relieve tension or pain. FAR INFRARED RAYS : Studies demonstrate that far infrared helps enhance circulation in the skin, modulate sleep, ease pain, protect against oxidative stress, and relieve inflammation. The benefits of far infrared therapy are enhanced by jade stone, which helps healing heat penetrate deeper while producing soothing negative ions. 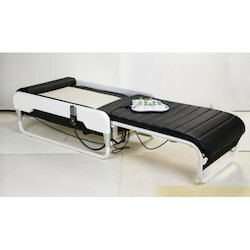 Looking for Massage Bed ?